In future the Prime Minister will look to his right where he will see the Chief Rabbi of Israel, perhaps even The King! Convergence of Jewish Law and Common Law in Israel - not inconceivable! The 2016 Pew report entitled ‘Israel’s Religiously Divided Society’ delved deep into the issues that distinguish Jewish religious and secular groups. Among their many reporting's were these statistical extracts that demonstrate strong support from the religious and traditional communities that religious law should prevail. This paper suggests a way forward through the complex issues that arise from a nation governed by one body of law that competes with a sentimental and often preferred alternative. Preferential support for religious Jewish Law (halacha) is growing and demands by religious-political groups continue to meet political reality. However, the slow bleed of halacha into common law is no unifying principle. Rather, the nation should reach a conclusive view as to how it wants to reconcile its preferences so as to build the best outcome for the nation's future. For most this won't be easy to digest, but halacha and secular law is bound only in convergence via parliamentary legislation. This paper suggests a way forward imagining that societal demands for integration of Jewish Law will continue in the face of rising opposition. But, there is a mutually beneficial managed outcome. Jewish sovereignty secured by rabbinical representatives elected to an upper house of Israel’s future parliament (Knesset) may be confronting to many, but the national benefits are presently misunderstood and misconstrued. Reorganization of community representation, suggested by this paper is already gaining momentum. Over the next 25 years the nation will begin to understand and realize the social and economic benefits that will flow from it. The majority of Israel’s Jewish electorate periodically participate in religious services of a local synagogue. Presently, members of these community synagogues nominate municipally appointed, government funded Town Rabbis to represent their communal religious interests. Elected Town Rabbi’s are self-interested to empower their electoral framework and elevate it to a more prominent place on the national political stage. Grass root, community participation is a principal requirement for any such advance, therefore town hall meetings, community activities and societal representations organized by appointed Town Rabbis and leaders are campaign hallmarks that will mark the successes of this movement. Participation by religious professionals servicing the judiciary and other segments of Israel’s legislative and legal sectors will provide support to integrate Israel’s secular laws with balanced, favorable (to society) interpretations of Jewish Law as founded in Torah and Talmud. This process will strengthen Jewish Sovereignty and realize one body of law for the entire nation. Simultaneous growth in the demand for unskilled labor will be essential to improve the wealth of Israel’s constituent underclass. Political parties that prioritize development of sustainable industries capable of employing a significant portion of the non-participating workforce will benefit. Israel’s indigenous and cultural prerogative, including tourism is a principle dogma of this plan. As such this powerful linkage of community representation and sovereignty is tied directly to economic prosperity through means for people to develop skills, obtain economic benefits and improve wealth distribution to the broader population. The role of the Rabbi: Spiritual leader or religious governing minister? We investigate the role of the elected rabbi in the modern era, especially in Israel and seek to define the authority that will be required to fulfill this unifying role. a. look after babies born out of wedlock, known as 'bastards' so they don't land in the hands of Christian church. The rabbi's duty is to hire nursing staff to raise these children as Jews. Parallel explanations clarify the social attitude of the Brisk rabbinical dynasty. The first is entirely pragmatic: As the spiritual leader of the community, the rabbi is the only one in position of authority that allows him to fight the wars of the weak and oppressed. This battle is a holy war of doing justice, charity and benevolence, fundamental Jewish values to which each person must strive to reach. The second explanation adds to the first, and views the rabbinate as a reflection of "walking in the ways" of God. Leading the congregation is a multi-dimensional mission in the name of God, a "long arm" of making the will of God on earth. Just as His attributes are to grace the poor, to elevate the crushed ones and revive the spirit of the humble (see Isaiah 57.15), so too that should be the role of the spiritual leader, the rabbi must focus on the disadvantaged exposed to abuse by the powerful. In this way, the rabbi continues the traditional role of the Bet Din (Jewish Law Court) "to save the oppressed from the hands of the oppressors". However, it seems that the social role does not substitute for the traditional functions of a rabbi, but adds to them. From the testimony of Rabbi Michel Zalman Shurkin. He brings another approach to the role of the Rabbi; "when they asked the Gaon Rabbi Raphael [Shapiro] what is the work of a rabbi, he responded: nothing, just to sit and learn Torah day and night". In his work "the Halachic Man" Rabbi Joseph B. Soloveitchik mentions the Brisk perception of the rabbinate. To his view the rabbinate does not deal with teaching and political leadership, "but fulfillment of the ideals of justice is the pillar of fire of a rabbi and teacher in Israel. Fulfilling these ideals is the purpose of creation, imposed on the person, correcting the world through the kingdom of halacha (Jewish Law) and revitalizing creation". "the halachic man materializes the Torah with action, without concessions and compromises, since indeed fulfillment of Jewish law is his desire and glorious dream. The halachic man is fearless of humans hence he creates worlds and partners with God in the creation of the world. Since he has no fear of humans he does not betray his mission nor does he desecrate the holy. He stands in the real world, with his feet stuck in the ground of reality, and he observes and sees, listens and hears and protests openly against oppression of the poor, theft of the impoverished and the cry of the orphan. The role of the rabbi is to ensure that the Torah and Jewish law will not be far away and cut off from the daily affairs of the community, but rather they will see it as an essential part of life itself. Rabbi Soloveitchik (ibid) explains that "halacha does not seek divine transcendence or flying on the wings of the abstract and mysterious. Halacha looks directly into the real world and does not distract from it." It is therefore the role of the rabbi to bring the Torah- Halacha to its real, concrete expression in worldly life of the communities members. Practical halachic decisions and concern for the disadvantaged, according to this principle are two sides of the same coin: a halachic man and the communal Rabbi who is in charge of both. In summarizing the various roles of the rabbi, as discussed in the previous section the essence of the role is spiritual leadership. This leadership is reflected on the one hand by teaching people how to act through the study of Torah, on the other hand it is shown by concern for the weak, strengthening religious institutions and introducing their activities into the lives of the community. When asked to explain his refusal to apply for the post of Chief Rabbi of Israel, Rabbi Soloveitchik clarified the gap between a rabbi as spiritual leader and one who is a mere religious minister: "The rabbinate was not for them [my ancestors] an issue of the position in office, but rather a matter of holy work of Torah study with Jews...their attitude to the community folk was not formal at all, but personal and intimate, as a rabbi has with his disciples. For that reason, my ancestors lacked the typical features of [modern] rabbis. Their garments were not rabbinical! They never let the congregation wait for them to conclude the Amidah (prayer)...unfortunately, I did not inherit a lot of the great virtues of my ancestors, but some things I still inherited from them: a lack of affection to ceremonies and love for teaching. I do not see the rabbinate as an institution and its head as a symbol of the institution...I despise formal ceremony and artificial manners, segregation associated with high positions is particularly alien to me especially formal representative ceremonies...In short, as a formal rabbi with all that entails, I am a failure". While talking on a personal note, it is clear from his words that he saw "the ceremonial Rabbinate" askance. This Rabbinate, which to his understanding characterized the Chief Rabbinate of Israel, can be defined as the transformation of religious leadership of the Rabbinate into a rabbinate of "Religious Ministers" - a style, in the opinion of Rabbi Soloveitchik better suited to Christianity than to Judaism, because it distinguishes between the spiritual realm of life to the physical one. More than the personality of the Rabbi, the character of the rabbinate, as leaders or ministers depends primarily on the authority given to him. In this regard one should distinguish between authority conferred from his community, in the style of the authority of a "parnass" [communal political leader] appointed with public consent and the authority granted by a state authority. Clearly, the first style suits the spiritual leadership since the hearts of the members are open for this leadership, whereas the second is inclined to the religious ministry officiating formally and detaches from the style of the former. In the present era, many towns and neighborhoods are secular. The lack of authority of the rabbi in the modern community is due to the eroding desire of the public to grant authority. It doesn't mean that rabbis stopped officiating. Also in modern communities, the rabbi continued to serve and monitor the religious affairs, but a distinction has arisen between religious and secular life. Therefore, the Rabbi's authority has been reduced to supervising life ceremonies, marriage, births, funerals and shivah's, which lack any connection to the routines of everyday life. Design of communal life, even their spiritual aspects; remain in the hands of the political authority, with no rabbinical intervention. Analysis of the present state of the rabbinate in Israel can be divided into two parts. The first and more significant for our purpose are the elected rabbis of towns and neighborhoods among the general public. In this regard their situation is similar to the new rabbi serving mainly as "Religious Minister". Contrary to early times, the authority of the town or neighborhood rabbi does not depend upon the will of the public. Sometimes elections are held, but usually the community is not aware of them and the result does not reflect their will. Instead, the authority of the rabbi is given to him by virtue of the state and it focuses purely on religious matters: Kashrut, Mikvaot and Eiruvin. The Rabbi is also in charge of religious ceremonies, but in civil day to day life the role of rabbi is significantly reduced. The second part is the pool of neighborhood rabbis available from which the ‘elected’ rabbi will appointed. Each in place by the free will of the members of the community. In these cases, the rabbis are involved in community life intensely deal with general issues such as housing, education to personal issues such as disputes between neighbors and spouses. The difference is of course the will of the community. Nevertheless, it seems that this will reflects a much deeper relationship a factor that is worthy of consideration. If we want to see the return of rabbinic involvement in broad, public civilian life, which can happen only if the public wills it, it is necessary to bridge the gaps between the rabbi and the population he is to lead. These gaps are structured into the educational and cultural differences between secular and religious, particularly in relation to Haredim. So, it seems that the only way to restore people’s confidence and desire for rabbinic involvement is by training and community wide educational programs. Traditional rabbinical training that focuses solely on Halacha, is not sufficient. The need is for extensive training that will enable rabbi’s to heal the present societal alienation and allow them to return to a position of popular influence. This training should include some exposure to worldly values, trends in modern/secular thinking and provide a basic level of introduction to global and Israeli culture in particular. Possible and desirable this framework would establish a special course for young rabbinical candidates that would complement traditional Halachic studies to establish solidarity between the rabbi and his local members. One may define this complement as a form of "language interface". An average Haredi person lacks the language of communication with his non­-Haredi counterpart. And without a common language, it is impossible to lead! It's clear that a plan of this nature will be opposed. However, those who oppose can continue to serve as rabbis in voluntary Haredi or other religious "private" communities. A person who sees himself fit to serve as Rabbi for the general public - a public that does not belong to his own religious sub-sector - will take it for granted that he must acquire the appropriate tools for this position, both the Torah and secular skills. In another letter to the same recipient (from 1956) Rabbi Weinberg repeats his view of the need for training educated rabbis, and reveals that the main reason for this is due to the necessity for rabbis "who are well versed in the ways of the world and can influence the youth”. On the opposition of the "Haredim and rabbis of the old type", who oppose any amendment in the rabbinic educational institutions, he says "it is really a very tragic situation." Unfortunately, this "tragedy" bore fruit, and is to blame (at least partially) for turning the rabbinate from a spiritual leadership role into a functionary role of a religious clerk. By law, the Chief Rabbinate of Israel (“CRI”) which serves as the highest rabbinic institution is responsible for providing religious services to all Jewish residents of the country. This includes Torah training of rabbis, rabbinical judges and shochatim (slaughterers) and provision of certifying them to serve in office. The CRI is also responsible for operating a State Kashrut system and registration of marriage and divorce. As any statutory entity it may enact regulations, which obligates the appointed rabbis in any venue or position and are subject to its provisions. With its formal authority the CRI is authorized to grant two types of titles and certificates: those acknowledging Torah scholarship: 'Yoreh 88" and 'Yadin Yadin" certificates - indicating the holder succeeded in written tests on various select Laws from the Shulchan Aruch suited to the role the candidate applied for (Rabbi of Neighborhood, of Town or Dayan [Rabbinic Judge]). Another is the "Ability certificate" attesting to the candidate’s fitness to serve in a position, granted almost automatically to those wishing to be appointed as rabbis of cities or rabbinical judges after their lifestyle and suitability for the post were examined and they were interviewed before a committee. Out of ~3000 students tested annually the "ability certificate" is awarded to a mere 500 to serve as rabbis of cities. Only a few dozen are appointed as rabbis across the country, the appointment is carried out in coordination with the designated community and the Ministry of religious affairs, occasionally taking place a very long time after the time of the test. The main problem is the lack of correlation in training and variation with the dual role. Reviewing the historical and Torah role of the rabbi proves that it stands on two main foundations; Authority as "Halachic decider" requires knowledge of Halacha and "Communal leader", requires spiritual responsibility towards the public. As the CRI carefully scrutinizes the Torah education scholarship of the candidates, it turns a blind eye from the more complex rabbinical leadership role. Rabbinic candidates are not required as part of their training to intern under acting rabbis and there is no way to ensure that they are skilled to mediate their Torah to the crowd. Are they equipped with socio-political intelligence in order to lead their congregants in the right path? Are they able to communicate in a productive and empowering way? Reality shows that it is precisely in the modern era that the role of "communal leadership" has become more complicated, and Torah knowledge is not a reason for ignorance or secular matters sufficient to rise to become a leader. Finally if the Rabbi is not seen as a "merciful father" to the congregants, they will not turn to him to seek Torah from him and benefit from his sage counsel. Appointed Rabbis are required to work with diverse communities in their own cultural languages and levels of religious commitment. Many see this as minor sector role, and feel alienated from the rabbi and others see him as a "religious technician" giving a technical service only for lifecycle events. Even when a congregant refers to his rabbi, the referrals often cover areas for which the rabbi had no training for, like problems with relationships, sexual abuse, education, various disputes (mediation), and more. The rabbi also lacks basic working tools for public management in the modern world, such as computer applications, speech and rhetoric, and proper language. In this situation it would difficult for the rabbi to become a leading figure, whose Torah - Halacha dialect could be translated into a professionally articulate moral language, that could constitute a source of sympathy for a public ever seeking significant statements and spiritual support for life crises. This fact contributes to the decline in the appreciation accorded to rabbis who are viewed as "free riders" eating from the account of the public without providing any meaningful service in return. Training program as a prerequisite for the "Ability" certificate. This program takes place, one day per week for as long as two years. Alongside the Yore certificate, participants of the program would be recognized as BA graduates, in relevance to the Israeli public service. A. Basic familiarity with therapeutic tools on family, relationships, violence and sexual abuse, enabling the rabbi to identify and refer those in need to more extensive professional help they need. B. Deepening knowledge of Jewish philosophy and its ways of confronting various challenges along the ages. Useful tools such as the theory of rhetoric and speech. Conceptual language for holding significant dialogue relevant to the community and its cultural values. This is part of a wide and encompassing leadership tool box. It includes the ability to translate Torah language into 'Israeli' dialect. Analyzing moral dilemmas stemming from current affairs, from their social and legal aspects, including a deep familiarity with groups and individuals in Israeli society. Attaching an experienced rabbinic "mentor" to the students, along with a professional Torah support network for the program graduates, this as an alternative to the conventional Shimush (internship) prevalent in the Torah world. Active Rabbinical representation in Israel’s judiciary is virtually nonexistent despite the obligation to refine social justice as expressed in the Torah portion Shoftim and the requirement to pursue that end in Talmud Sanhedrin (32b). Such pursuit relates to the effort an individual expends to bring all of society to a more refined state, in this case through a superior judiciary. Although Torah and Talmud may emanate from a different era, the responsibility to refine justice is unequivocal at all times. Therefore the obligation is active and must be carried out with clear intention and conviction. This paper defines a plan to achieve such a result. Rabbinical ordination and certification to practise law may not appear to have much in common, but Israel’s state judiciary would be better served by qualified applicants who have also learned the legal foundation of Torah. Such a scenario in which these qualified individuals integrate and assimilate ideas through the Ministry of Justice is one where the Rabbis and scholars of Israel’s communities and their various Talmudic institutions take command. In doing so they also fulfill their obligations to pursue justice in a manner that would imbue Israel with a more just judiciary capable of incorporating into precedent substantially Talmudic principles. The number of places available to students in Israel’s law schools is limited. Each year approximately 1500 students qualify the bar examination to become lawyers in Israel. Some move to private practices, partnerships, corporate jobs, politics, advocacy and the judiciary. Whilst enlistment is competitive, selection of accomplished Torah students would virtually be be assured and supporting grants could encourage this development. Although negative biases at certain educational institutions may prevent a fair balance of religious enlistment, it would not take more than a few years before selection on the merits prevailed. Increasing religious participation in the legal affairs of Israel is a sure way to bring productive Torah principles to the nation. Concern about imbalanced secular influence has led to an isolationist response by many Haredi communities. Such community wide response can be progressively improved by their participation in the Israeli judiciary with a view to producing laws that would reflect their interests. Some communities are already participating in this manner and we are encouraged to support them in their efforts toward these stated objectives. Working with the Ministry of Justice and the administrator for judicial appointments, including magistrates we intend to promote a more balanced representation from the Haredi and religious sector. Israel’s government and constitution are remnants of the British system of government prior to 1948. The unicameral Knesset and Basic Law of the country followed forms that did not emanate from Jewish culture and therefore remain somewhat cumbersome, not addressing national, traditional or religious constituents particularly well. Further the 20% mostly Muslim block of Israeli Arabs are often antithetical to sensitive national issues that favor the Jewish majority because of an ambiguous constitutional construct. Although not immediately apparent, Israel’s unicameral system of government does not ideally represent the demographic it represents. Voter turnout over the past 50 years has progressively dropped from the 80th to the 60th percentile, but voter turnout is not the primary issue. More than a third of Israeli Jews observe traditional laws and another 25% consider themselves to be traditional non-observing. Returning Israel to its more traditional model of judiciary and government will be culturally compatible for its majority Jewish population. Notwithstanding the spread of secularism in Israel, economic pragmatism will continue to direct domestic politics toward this ideal. Establishing legal and cultural uniformity will certainly clarify the sovereign rights of Israelis, but the objective of these unilaterally mandated propositions is to significantly boost economic development for citizens. The legal and citizenship rights consistent with a democratic institution to appoint a king are not foreign to Jewish culture or those of the region and the benefits of a constitutional sovereign, would ultimately accrue through pomp, ceremony and constant global fascination that would boost tourism well beyond anticipated levels. A newly convened group has been established to promote and educate the electorate, electoral assembly and Town Rabbis to provide direction, insight and inspiration to ultimately move a resolution on a referendum for a bicameral structure of government that would draw its new members from the electoral framework specified in the The Jewish Religious Services Law, 1971. The shortfall in contribution to GDP through added revenue from tourism is now widely acknowledged at various levels of government and is closely tied to unskilled labor demand. Response to the shortage of hotel rooms is the acute focus of government evidenced in development grants that offer 28% cash rebate for approved developments. In addition very few municipal councils in Israel will not grant relaxed zoning conditions for new hotel developments because these offer significant contributions to the economy of any city. The economic shortfall from Israel’s sub-optimal exploitation of global tourism demand presents an opportunity to build and focus awareness on Israel’s most significant national economic initiative. The government views the deep reforms required to address the complexity of the issues, but has not actioned all of the top down changes required to realize the benefits that would flow. Realizing potential revenue and employment advantages from tourism requires Israel attracting, accommodating and facilitating millions of additional visitors to the country each year. Planning and developing infrastructure, attracting capital and skills and training and educating workers needed to kick start the momentum is a significant undertaking that requires attention from the Prime Minister and the entire cabinet. The Jerusalem 5800 team are a good example having assumed responsibility for planning a future Jerusalem capable of expanding tourism by providing hospitality and infrastructure for residents and visiting guests. These plans are now well established, published and in circulation among the country’s most active bureaucrats. Planning has occurred over much of the past 3 years and the principle project team will soon complete its initial work. The work on individual projects anticipated by the plan will soon commence and are expected to span the next 25 years. Jerusalem anchors Israel’s ability to attract mass tourism, its unique qualities allow it to compete in a world filled with malls, tall buildings and resorts. Inherently its ‘holy city’ attractiveness guarantees it a significant place on the world stage, but narrow vision, distractions and complacent attitudes are a constant threat to the city realizing its full potential. To illustrate the magnitude of the attitudinal shift required, we return to the idea at the opening of this paper - sovereignty expressed through national religious representation. In order to advance Jerusalem and other major cities in Israel to their ultimate and most beneficial conclusion, a new, but different phase of planning and development for Israel leading to the year 5800 will be required. Anything less than a cross-government, highly professional approach, the likes of administrators who transform a city in preparation for the Olympic Games, would be a poor result. This effort must be fully embraced by the highest office of the land, as such the Prime Minister must have received a mandate for the idea’s covered in this document from the electorate as the Knesset platform on which they are voted to power. Appointment of Israel’s Town Rabbis is governed by the Minister for Religious Affairs. Town Rabbis are elected via the electoral domain of the Religious Council, city council, synagogues and communities in accordance with The Jewish Religious Services Law, 1971. They receive lifetime appointments. The election of Israel’s chief Rabbi takes place in accordance with Chief Rabbinate of Israel Law, 5740-1980* through a legal Electoral Assembly that forges an alliance of 150 people made up of elected Mayors and Rabbis of Israel’s largest city’s, public figures, religious and regional councils and knesset members. In all 80 Rabbis and 70 members of the public make up the body required to make the appointment. 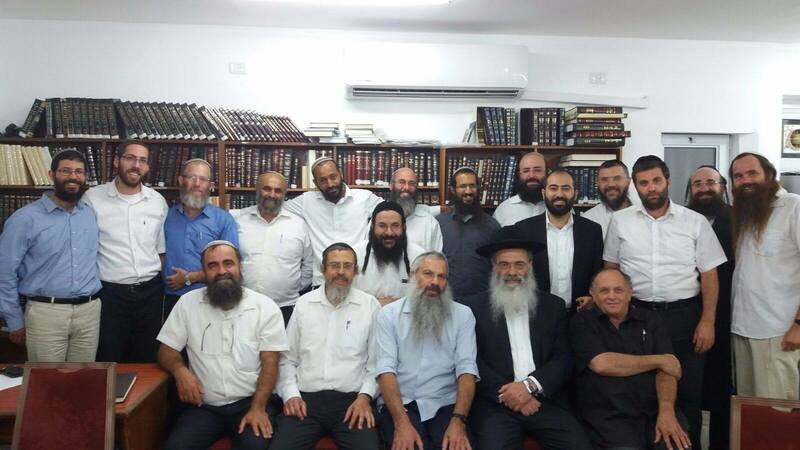 ● (8) ten rabbis appointed by the Minister of Religious Affairs with the approval of the Government. ● (8) ten members of the public appointed by the Minister of Religious Affairs with the approval of the Government. The overwhelming construction of this Electoral Assembly are religious representatives making up 98 of the 150 members. Whilst this Electoral Assembly is a temporary body assembled for the purpose of electing the chief Ashkenazi and Sephardi Rabbis, its 80 Rabbinical members are empowered in communities that extend deep into the heart of the Israeli electorate. These Rabbis have within their collective power the ability to move the nation toward electoral reform to enable Israel to finally address its constitutional construct, legal authority and sovereignty. Any initiative directed to bring such constitutional change would need to occur from the level of Town Rabbis who would lobby for and obtain community support for such an initiative. The hurdles to any change are high, to understand them let’s look at referenda in Israel. The Basic Law of Israel does not provide for the holding of referendums and the country has never held one. The holding of a referendum has been proposed several times over the course of Israel's history, although none of these proposals have ever succeeded. David Ben-Gurion proposed a referendum on the introduction of a majoritarian electoral system in 1958 to reduce the influence of the National Religious Party. Menachem Begin proposed the introduction of a legislative initiative, which would have allowed 100,000 citizens to demand that a proposed law be submitted to a referendum. The referendum was also briefly discussed in the 1970s, when a plebiscite over the future of the West Bank was considered. The enactment of significant constitutional reform would require the Knesset to adopt a nationwide referendum or at least a referendum of a Knesset supermajority, a seemingly impossible undertaking at this time. However, analyzing the reasons why events that promote such an adventure could be embraced by the country and its elected representatives are beginning to become apparent. The national disparity that exists between religious and secular Jews also exists between Ashkenazim and Sephardim; Haredim and Religious Zionists; new immigrants and old; hardline Muslims, Christians and Jews; Bedouins and Druze; people under the Palestinian Authority, Gazans and Israelis. In addition post military education ensures Israel’s concentration of the highly skilled, while torah scholars and those without any post school education are often left without skills. The principle unifying prospect for such a diverse society will be that which provides the most apparent economic benefit. This presents a unique opportunity in Israel for constitutional reform centered on employment centric economic prospects that are otherwise not obtainable. Although other sector opportunities may contribute, tourism associated with Israel as the “Holy Land” stands out from the crowd. A promoter organization has enlisted Town Rabbis and Electoral Assembly officials to form a loose body that concentrates its lobby to organize its electoral framework to serve Israel and its economic objectives. The promoter organization, operated without fanfare, will direct its objective to promote its ideals and organize its participants. Its objective is to document and approve a charter directed toward establishing a bicameral parliamentary system, by referendum using elected Rabbis to perform a national function beyond their present role as ‘Town’ Rabbis. Promoting the expanded mandate of the existing electoral framework, by which Town Rabbis are appointed, as a means to elect a second house to the legislature of government is a starting point that will no-doubt transform as the idea matures. Although the development or even the marketing of such an objective is feasible, a factor of financial budgeting, the higher motivation and inspiration to drive toward the objective would make such an initiative far more compelling for many of its participants. If the body of participants are motivated by the prospect of expanded power and by a higher reason to obtain it, there may be sufficient impetus to achieve the objective. The multitudinous and substantial issues to be addressed by any elected body responsible for approving law in an upper house of a bicameral parliament would be daunting. However, as the nation and the Jewish people’s authoritative religious body, its higher purpose would also become the progressive amalgamation of religious and secular law in order that Israel’s indigenous Jewish culture be expressed and fully exploited to the benefit of all its people. Such an ambitious undertaking can only ever be initialized by motivated participants who bring a religious and secular sensibility and can foresee a future Israel which enables its prophetic cultural realization and releases the economic benefits that flow from it. Envisaging and developing a path forward is a function of education and direction toward the objective, a matter of interpretation already well prescribed in the Jewish exegesis. The separate existence of national and religious law establishes a basis for confusion and dismissal, each rendering the other impotent at the secular and religious fringes of Israel’s Jewish society. The equal application of law by Israel’s executive and enforcement agencies is made more difficult by the existence of underlying legal precepts that are culturally observed to a lesser or greater degree by diverse groups in different parts of the country. Israel’s unicameral legislative structure cannot serve its cultural or religious disposition because it does not permit an authoritative body of representatives qualified in accordance with halachic principles to prevail over it. As such it is conflicted by its inability to express Jewish sovereignty over the land to which it claims an indigenous right on behalf of its Jewish people. This proposition addresses the present shortcoming. A law to enable a one time national referendum to introduce a bicameral structure would also introduce to the national debate the constitutional representation in Israel’s sovereign image. The election of Town Rabbis to the upper house of a bicameral parliament is presently influenced by public opinion through the Electoral Assembly and Minister of Religious Affairs. The future process would ensure that selection criteria as modified in the course of drafting the referendum, would satisfy the demands of both religious and secular communities in Israel. The hope that Talmudic law and Israel’s state laws would converge as enabled in a bicameral parliament would shift the paradigm. In such a scenario Knesset Kattan (upper house) would be responsible for approving law, Knesset Gadol (the existing lower house) responsible for drafting law and the executive branch under the Prime Minister responsible for administering and executing law. Toward a positive referendum, momentum for economic growth can be characterized in terms synergistic with the vision of Israel’s postexilic future. The present desire of local and state government is for 10 million tourists to arrive in Israel each year from the present 3.5 million. The presently stated requirement is an additional 19000 hotel rooms to be constructed in Jerusalem in order to accommodate 5 million tourist arrivals. Although enormous potential exists, the complexity of the task requires a detailed knowledge, much of which can be understood through the work of the Jerusalem 5800 team. Ultimately the limit to tourism arrivals in Israel is unknown because the expression of sovereignty in a bicameral government would also allow Israel to resolve its cultural and religious prerogatives, which would significantly increase tourism demand and boost the economy accordingly. For every 1 million new tourists GDP increases $1.8 billion and includes at least 20,000 direct jobs and 60,000 indirect jobs in employment classes which span unskilled and skilled labor sectors. The future benefit to people in Israel and Jerusalem as a direct result of tourism is arguably more significant than any other single industry sector. In addition to economic benefits, tourists leave Israel with a realization of safety and security an orientation that counters the dangerous image cast upon Israel every day in the global media. A bicameral government that provides this stimulation and direction would finally re-establish Israel’s most important cultural, religious and national icons and assets which would add significantly to the nation's economic outlook. Perhaps the promise of a restored, authentic Jerusalem competing with annual pilgrimage to the Vatican or Mecca, where history and exploitation of narrative entertain visitors who can be touched in ways never before imagined, is sufficient to motivate Israel’s secular and religious communities to recognize and realize their awaiting benefit. ( Rambam, Laws of the Sanhedrin, 2,7). (Zalman Shurkin, Meged Givot Olam (Jerusalem, 1999), p 57. (Rabbi Joseph B. Soloveitchik, the Halachic man: visible and hidden (Jerusalem, 1979), p 80). The Subject of Kashrut was formalized in the "Kashrut fraud prohibiting" law, 1983. See Rule 5 (3) of the Jewish Religious Services Regulations (town rabbi's elections), 2007. The regulations prescribe the places which require a Rabbi,the qualifying conditions, and more details.For more see the legal section of this document . 88 From the website of the Chief Rabbinate - Certification and Examinations Department.